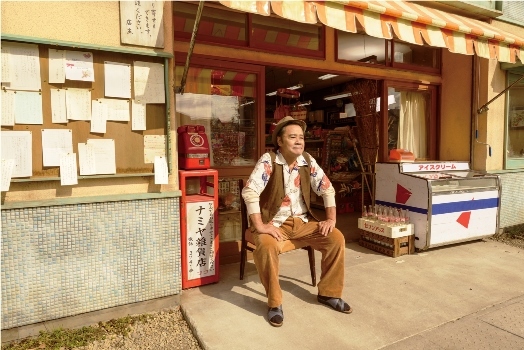 The Japanese award-winning Toshiyuki Nishida plays the titular role of provision-shop owner Namiya with class and finesse in this sweet movie, The Miracles of the Namiya General Store. Kanichiro and Nijirô Murakami – offer plausible support to this story, based on a book by mystery writer Keigo Higashino. The plot has an intriguing concept of time-travel wrapped in tendrils of linked tales of hope, love and even nostalgia. Ding-donging between 1980 and 2012, at the heart of this story is Namiya whose shop’s noticeboard also boasts notes from the neighbourhood folk asking for his advice. He writes down his advice and pins it back on the board. People also drop off their questions in his letterbox through the shutters, and he leaves his reply in the milk box. Does it sound similar to the 2006 Keanu Reeves movie, The Lake House? It isn’t because it’s not one long romantic tale but several lifelines, all filled with love. Quaint. Old-fashioned. The Agony Aunt of newspaper lore, translated in book and on screen. The teenage trio in 2012 end up at the shuttered, abandoned Namiya General Store after “teaching” a rich woman a lesson. It’s the 32nd anniversary of Namiya’s death, and suddenly the letters start appearing through the letter-box in the shutters. They take it upon themselves to answer them, and the threads of connection to the trio backwards through time is slowly unveiled almost with Disneyque magic. It is a mystery, that goes into the realm of fantasy, but Higashino’s trademark multi-layered plot, if you have read his detective Suspect X series, is evident here too. Kudos to the director for segueing each link to the Namiya store with gentle rhythm, that it does not come out like episodes of a television series. I wouldn’t say one actor in the cast stands out, even if Yamada is already famous from his days with J-pop group Hey! Say! Jump or Machiko Ono from the 2013 Like Father Like Son weeper or even Kento Hayashi whom I remember as a child star in the 2007 baseball offering, Battery. The cast all offered good acting, and even the theme song, Reborn, by the 1980s singer Tatsuro Yamashita fits in perfectly with the do-good ideas of the movie. No. Ultimately, the exquisite tale is what you will carry out of the cinema hall. It’s a timeless story, of what doing a kind deed can deliver. I can watch this movie, again and again!